One way to save space in a home is to stack the dryer on the top of the washer. There are times however, that you might need to take the dryer off the washer for repairs or to move the units. Removing the brackets securing the stackable washer and dryer together is necessary to take the dryer off the washer. Each manufacturer has their own bracket setup, but they all install -- and uninstall -- in the same manner. Removing the stacking brackets enables you to take down the dryer for repairs. Unplug the washer and dryer power cords from their electrical outlets. Turn off the water supply to the washer at the spigots coming from the wall. Ask a friend to assist you and pull the washer/dryer combination away from the wall far enough that you can work behind the units. Loosen the screw securing the dryer duct hose clamp to the rear of the dryer with a Phillips-head screwdriver. Pull the dryer duct hose away from the dryer. Find the brackets attaching the dryer to the washer. The brackets are on either side of the rear of the units. Most brackets are pieces of metal attaching to the top of the washer and bottom of the dryer. Remove the screws securing the bracket to the dryer with a nut driver or Phillips-head screwdriver, depending on the head of the screw. 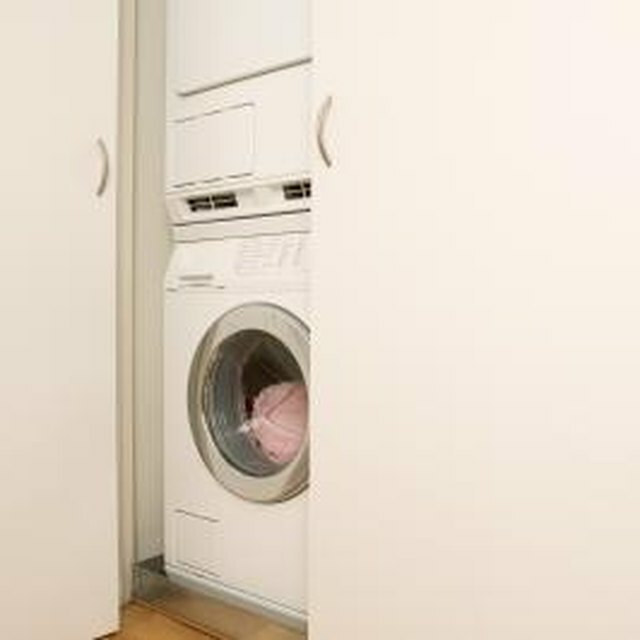 Slide the dryer forward with the assistance of your helper and remove it from the top of the washer. Turn the screws securing the brackets to the side of the washer counterclockwise with the appropriate screwdriver. Look for screws connecting a small flange from the bracket to the top of the washer and remove them. Pull the brackets off the washer. Some brackets have small tabs that hook on the washer top. Slide the bracket back slightly once you remove the screws to unhook the bracket.